City’s Vice-Chancellor, Professor Paul Curran, signed a new General Agreement on Strategic Partnership with Peter the Great St Petersburg Polytechnic University on 22nd April. 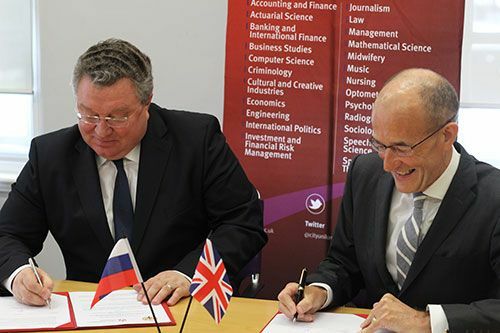 On 22nd April, City University London further solidified its relationship with Peter the Great St Petersburg Polytechnic University by signing a General Agreement on Strategic Partnership involving areas of mutual benefit to the two universities. City has enjoyed long-standing links with Peter the Great St Petersburg Polytechnic University. The first collaboration agreement with this Russian university was agreed in 1994 and subsequent protocols were signed in 2005 and 2006. An agreement signed in 2012 covered collaboration in education and research. The dual-award, full-time MSc programme in Computer and Information Engineering developed with Peter the Great St Petersburg Polytechnic University under a UK Government grant, is now in its eighth year. There are over 100 Russian students at City: they form one of the largest groups of Russian students at a UK university. The Strategic Partnership will be in place for the next five years and will support the development and implementation of Masters and PhD programmes; Academic Mobility programmes; research collaboration and exchange of research materials; the joint publication of research; cooperative seminars and workshops. City’s Vice-Chancellor, Professor Sir Paul Curran, signed the Strategic Partnership Agreement with the Rector of Peter the Great St Petersburg Polytechnic University, Professor Andrei Rudskoi. Peter the Great St Petersburg Polytechnic University’s Vice-Rector for International Relations, Professor Dmitry Arsenyev and Dr Vladislav Zhivulin, Head of the Rector’s Administration Office were also present as part of the visiting delegation from Russia. Participating in the Strategic Partnership discussion from City were Professor Stanton Newman, Pro Vice-Chancellor (International); Professor Roger Crouch, Dean of the School of Mathematics, Computer Science & Engineering (SMCSE); Professor Sanowar Khan, Deputy Dean of SMCSE; Professor Ken Grattan, Dean of the City Graduate School and Ms Abi Moran, City’s Validation and Partnerships Manager.